Weiser State forest is accessible off of Route 61 and there are forest roads that will put you on top of the mountain. I found a pull-off near a state maintained snowmobile trail and parked. I made sure I had plenty of hand warmers and water and headed into the woods with my fly rod. Before I started down into the hollow, I set a waypoint on my GPS. The walk down the mountain was more intense than I’d expected. There were areas of steep drop offs that would flatten out to small benches and then drop off again. The terrain became very rocky as I descended. I’d be hesitant of accessing this area in warmer temps because the terrain is a rattlesnake haven. Eventually I came across a small mountain spring that cut a path downhill. I followed it until it flattened out and ran into a grove of pine trees that enveloped the stream I was seeking. After another 75 yards of crawling through thick forest undergrowth, the small spring dumped into Rattling Run. It wasn’t as large as I’d expected, but large enough to hold a wild brook trout population. I decided to start fishing with a new version of my Pink Ferrari nymph tied with standard pink rubber legs. I had a 7.5’ leader tied onto my fly line and used the smallest lightning strike indicator I had in my pack. Small indicators or no indicators at all are important in the winter when the water is still and gin clear. The brook trout seem to spook easier in the winter. I headed upstream until I came to an area where there was a blown down tree that was damming up the stream and creating a deep pool. I cast my nymph and waited. There was no familiar tug on the line. I kept walking. I noticed several areas near the stream where there were old campfires and sections of paracord wrapped around trees. It looked as if someone had been living there, at least temporarily. I was surprised, considering how far this area was from any civilization. I walked another hundred yards upstream and found a beautiful set of waterfalls with plunge pools. I crept up to the first one and placed my nymph at the base where a small eddy was created by the churning water. 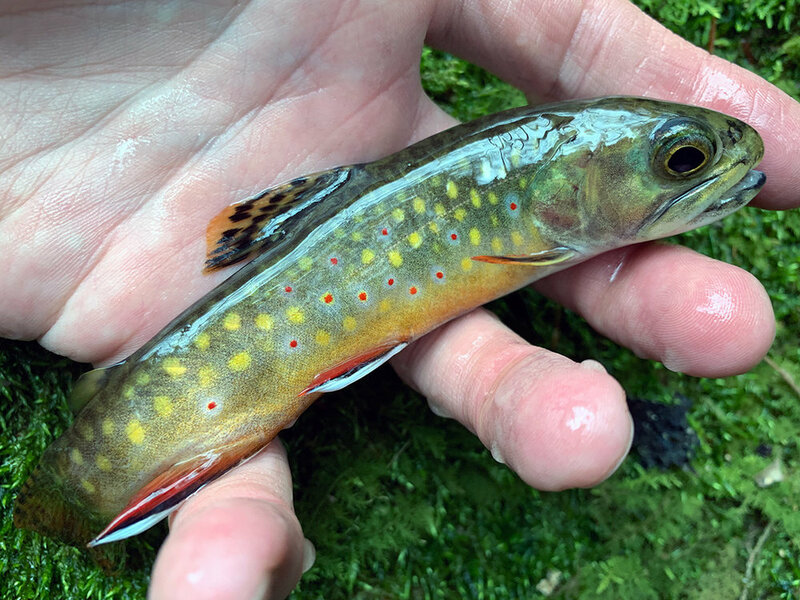 Immediately my indicator shot under the water and I set the hook on a wild brook trout. I brought the fish to my net and admired its beauty up close. 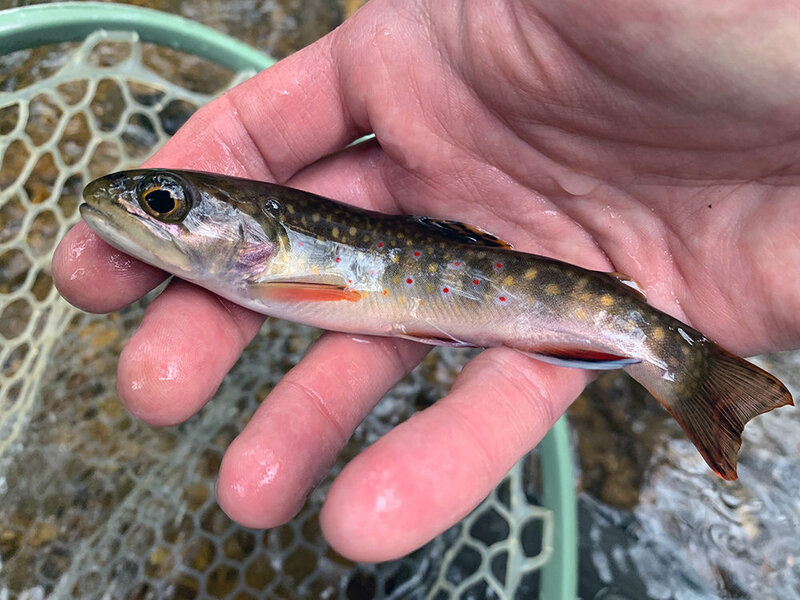 My first Rattling Run wild brook trout. It was amazing that wild trout were so close to home. I released her and watched her swim back to her lie in the clear water. The next hour of fishing was incredible. I brought a lot of brook trout to hand. The woods were silent except for the rushing water of the stream and the occasional rush of a small waterfall. As I moved upstream I noticed the footprints of what I believed to be a bobcat. The footprints crisscrossed back and forth across fallen logs that stretched across the stream. Perhaps he was just ahead of me fishing too. Portions of Rattling Run were open and didn’t have a large number of trees or brush on the bank, but other areas, especially further upstream, were heavily covered with rhododendron. These areas were very difficult to walk through and bow and arrow casts were required for any hope of getting a decent drift to a fish. Further upstream I ran into more wilderness huts that had been built by humans. They were fairly sophisticated, with well-constructed walls and supports made from found branches. There were old fire pits on the inside. I theorize that a group, like a local Boy Scout Troup or similar groups use this area, or perhaps there are locals that spend time here. Eventually I hit the line in the woods where Weiser State Forest ended and the State Game Lands started. The game lands are marked with red markers nailed to trees. I continued to catch brook trout on my walk. The fish were concentrated in the deeper holes and I caught many smaller fish showing that the population was vibrant. Winter Storm Harper was supposed to be dumping snow by early afternoon, but 1PM came and went and no snow fell. I figured I’d keep walking until I saw a sign of precipitation. By 2PM, still no snow. I looked at my phone and although there was a good distance until I’d hit the headwaters, the stream was getting very skinny and I decided I’d start my hike out. On Google Maps I could see a fire trail that ran across the top of the mountain and it came close to my position just a few hundred yards up the mountain. A beautiful waterfall and plunge pool on Rattling Run. I started my hike out and it was grueling. My legs were hurting from walking up such steep terrain. I had to take breaks every ten minutes. Eventually the terrain changed from wooded to almost entirely rocky. I wouldn’t have even considered walking through this area in warmer temperatures, as I’m sure snake dens were under these rocks. After 30 minutes I finally made it to the trail. Once I arrived, I had another 30 minutes back to the State Game Lands road that would lead to my truck. I followed the footprints of a guy who’d been walking his dog and a solitary mountain bike track. Once I hit the game lands road, I saw a hunter crawling along in his truck. I wondered if he knew road hunting was illegal. He would prove to be the only human I’d see in the forest all day. Eventually I rounded a corner and saw my truck and I let out a sigh of relief when I placed my hands on it. I was so happy to be back and almost fell twice while slipping in the snow and trying to get my waders off. By 3:30PM I was leaving the forest and still no snow. I started my truck and drove down the mountain with the gray winter sky as a backdrop.